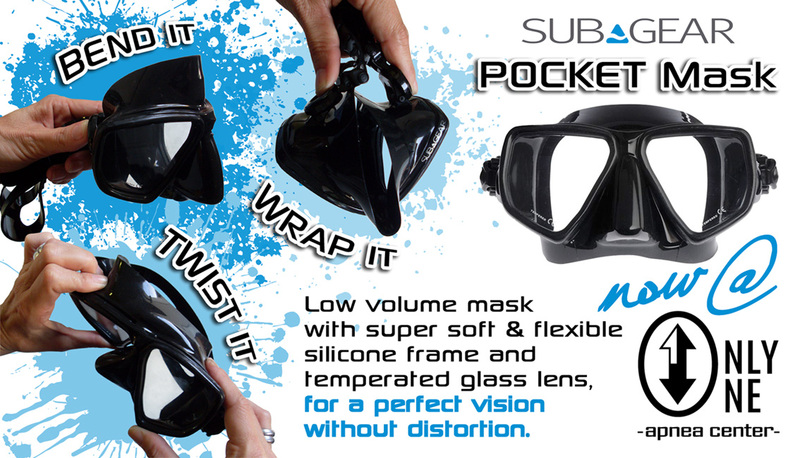 The news of the week seems to be the arrival on the market of the last mask produced by Subgear: the Pocket Mask. Since I have seen it on the shelves of the local Subgear dealer, I felt very interested on it because is very nice looking – I’m Italian and that is a master point!! – and because the quality of the silicone seems to be hyper soft and very comfortable. I have mustaches and still stays on my face! At a first look it can be easily confused with a classic free diving model: black color, squared lenses and a general flat shape, but after a closer look we can immediately recognize few new amazing details. For example the total absence of the frame, for a consequent very small distance between eyes and lenses, which improve visibility and reduce the inner volume. The strap is connected to the silicone part, instead of the plastic frame, for a perfect fitting on different face shapes. What really shock me the most, is the idea to remove the usual hard connection between two lenses, in order to give an extreme flexibility to all the mask. It can be twisted in any direction as no one else before and, over all for us free divers, has an exceptional “squeezing factor”. Per “squeezing factor” I personally mean the ability of a mask to get squeezed on our face during the descent without hurting us or getting flooded… this is a very important factor to consider when divers approach to deep free diving (40+ meters). Latest technique for deep free diving requires to don’t equalize the mask anymore after a certain depth, to increase the air left for the equalization of our ears, as a consequence the more the mask can be squeezed the less often we need to equalize it!!! Of course this is not the only mask on market that can do that (ex. Sphera mask) but for sure is the only one that doesn’t create any visual distortion, thanks to the flat glass lens that Subgear has cleverly used instead of the curved plastic lenses, typical of the direct concurrency masks. For all these reasons it can be easily used for many different underwater activities, eliminating the need to purchase many different masks, one for each single activity you like to do. In fact, it combines at the best a wide view angle (typical for scuba divers) and a small inner volume (typical for free divers) with a very high squeezing factor (typical of deep divers!). Happy to be perfectly back in action, with our platform in the water, ready to host trainings, deep dives and record attempts in any disciplines. You can spot our historical platform in the picture… just look at the small mystery object in the middle of the sea!!! We are really thankful to Sheikh Coast Diving Center staff and his manager for all the support and the precious help received to make our dreams comes true!!! Enjoy the blue and dive safe!!! 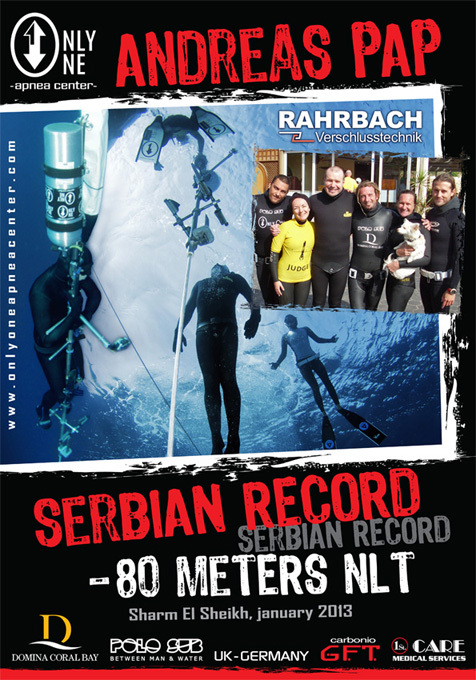 Felici di essere tornati perfettamente in azione, con la nostra storica piattaforma nuovamente in mare, pronta per ospitare allenamenti, immersioni profonde e tentativi di record in ogni disciplina. Potete vedere la nostra piattaforma nelle foto… basta che guardiate quel piccolo e misterioso oggetto in mezzo al mare!!! Siamo veramente grati allo staff dello Sheikh Coast Diving Center e al suo manager, per tutto il supporto e per il prezioso aiuto ricevuto per fare in modo che i nostri sogni diventino realtà!!! Finally our project has become a reality: from 1 week we have started the adventure in our new location inside the famous hotel complex Domina Coral Bay! Our office is beside the Sheikh Coast diving center, at only few steps from the flat waters of Tiger Bay… yes, we are definitely in love with our new location: no wind, no waves, no current all day long…. the dream comes true!